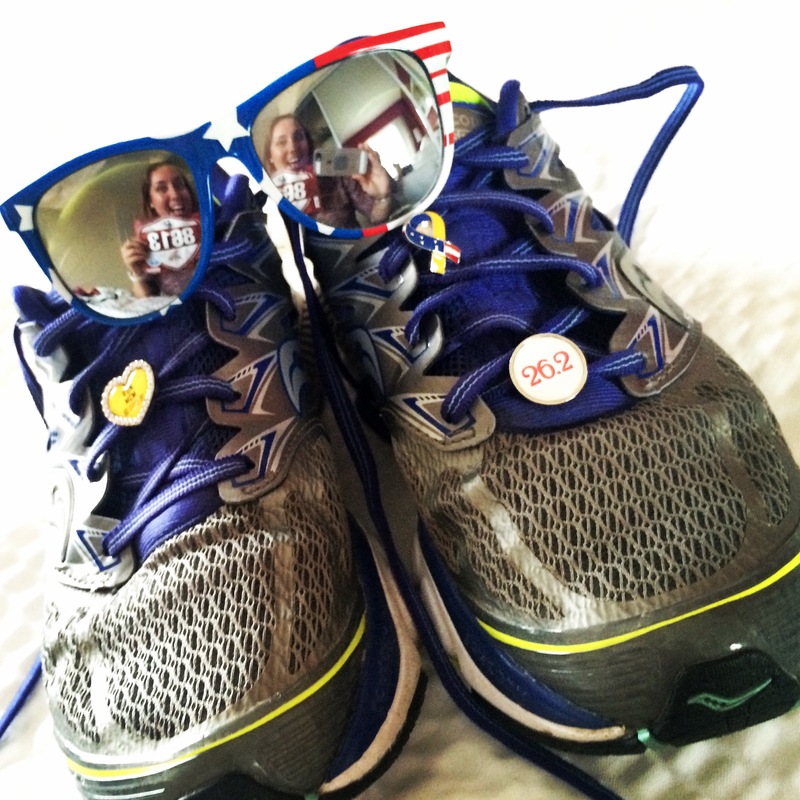 So a one month delay in recapping my marathon experience isn’t too bad, right!? In my defense, just 2 days after I got back from DC I closed on my new condo and have been in the whole moving-in crazy land and officially drained of all energy, even blog writing energy! Nonetheless, I know it’s not really a great excuse, but it is what it is! I still want to recap the amazing day (and trip!) and it’s actually kind of fun to be reliving it, in a way, a month later! Marathon #2 is officially in the books! It wasn’t an amazing time, but it’s technically a PR ( by 2 minutes and 8 seconds 🙂 ). 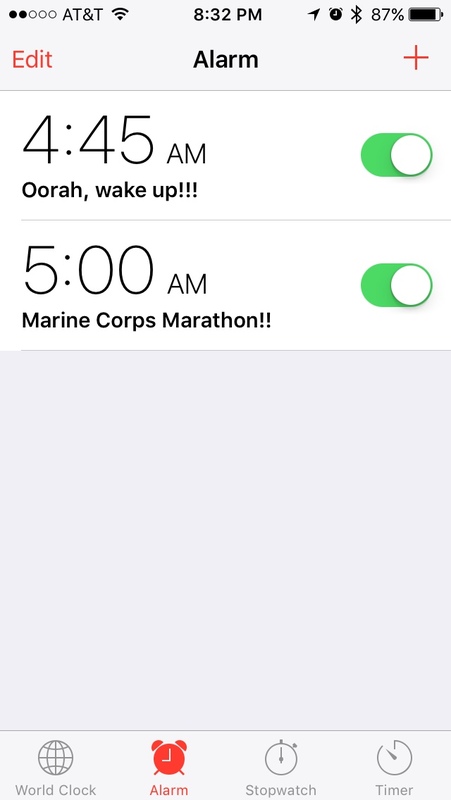 First, properly prepping the footwear with MCM, support your troops and 26.2 paraphernalia is key, but arguably not as important as the appropriate early morning alarm settings with the necessary motivational messaging! The morning of was crazy. Getting there was easy, albeit a little busy, but not terrible. 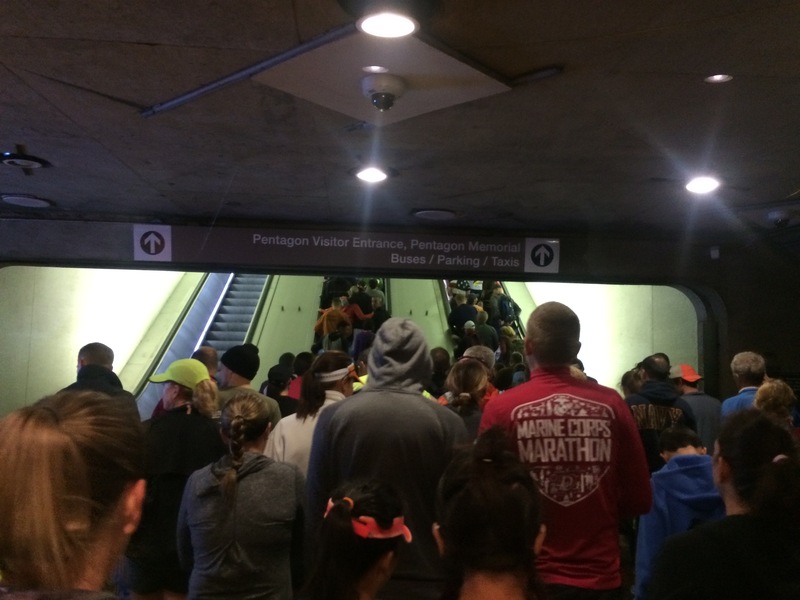 My parents and I navigated the Metro with thousands of other runners and spectators. The security line was bananas!! Like legit! Out in the rain for 90 minutes barely moving. It seems that the delay was like due to malfunctioning metal detectors, which I guess were not exactly weatherproof and the morning started out with a pretty significant rain storm. When the official start time approached and thousands were still not through security, they ultimately let those without bags scoot around the bag check folks and I said “peace out!” to my folks (maybe a little more lovingly!) and scurried to the port-a-potties and start line. I was able to see the paratroopers fly in the american flags and the ospreys fly in. Despite the security line back up, there was a little wait to cross the start. I snapped a few pics of the crowd of runners, obvi a selfie, and the start line arch and then I was off! This was a very busy course and I felt like I was rubbing elbows with my fellow runners for the full 26.2 miles. I took a few pics along the way but really mostly was enjoying the new sites and sounds since I have never run in this area before. Up until mile 16, I was also enjoying the Motigo messages left by my friends and family that were randomly popping up along my run! Sadly, between using my camera and this app my phone battery was starting to die so I had to stop the app and listen to the remainder of my cheers post-race. It’s such a cool concept, though, and I hope some of the bugs I gave them feedback about can be fixed so I can use this app for future races! Probably the weirdest part of this race for me was not knowing anyone along the way! Sure strangers are always super supportive, and that’s fun in it’s own way, but I will admit I missed my Boston experience when starting at mile 22ish I started seeing friends all along the way, making the race extra special and personal! 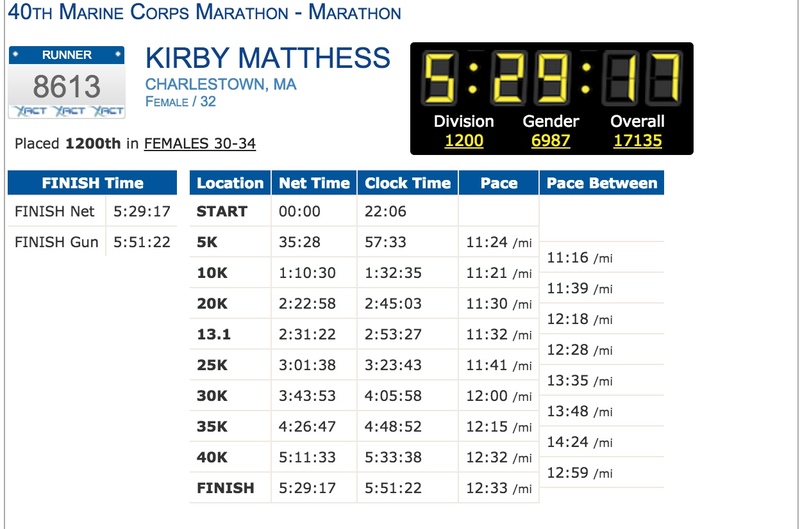 I was beyond excited to see my parents at mile 16 on this course, though! It was great timing, emotionally and physically, for me to have familiar faces. 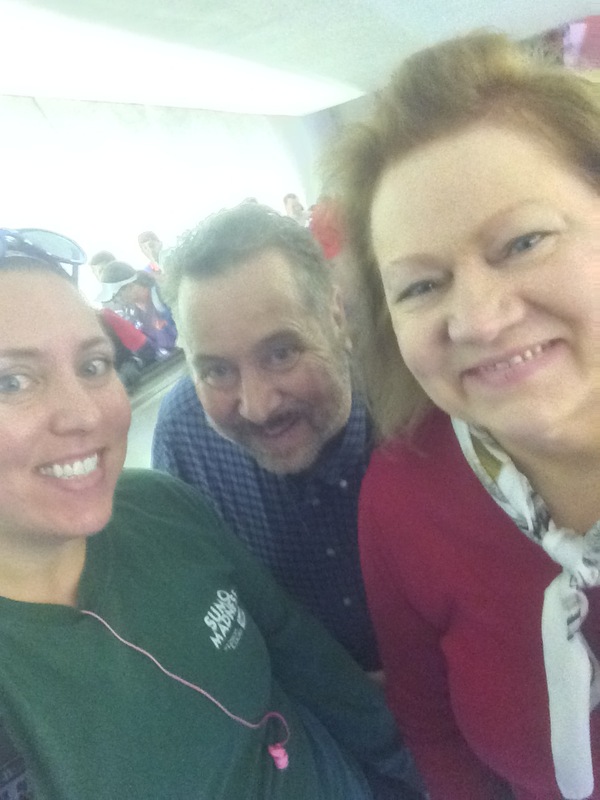 And our selfies even came out pretty great as well! Sadly I couldn’t stay and hang out too long, I still had 10 miles to go so I was off! The final hill to the finish!! It was amazing receiving my medal from a Marine! The medals are GORGEOUS, sparkly ruby to celebrate the 40th anniversary of the race. A fellow finisher helped me snap my own finisher photo at the Marine Corps War Memorial and then obviously I needed my own couple finisher selfies. That evening we went out to dinner at Old Ebbit Grill which is neighbor to the White House so we got in a few photo ops. Understandably I enjoyed a celebratory cocktail and our dinner was excellent as well! My parents and I stayed in DC until Wednesday and in that time we explored the National Zoo and did a monument segway tour through DC which was honestly so much fun!! Here’s a few highlights from those days and experiences. All in all, this was an incredible experience that I am so thankful to have had. Even better, I had the opportunity to make a fun family vacation out of the experience and that’s possibly the best part of it all! I’m looking forward to my next marathon goal, which I’m currently in the works of deciding. (Actually It’s mostly decided, but since this post is a month late admittedly a month ago it was still in the works 😉 ) I’ll have an update soon on my next undertaking and some ongoing posts through this coming winter of training!